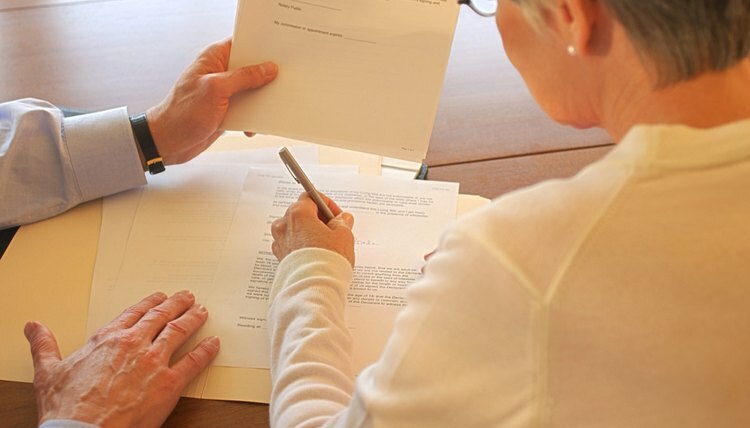 The signing of a will must be witnessed for two main reasons: First, witnesses can confirm that it was actually the testator whose signature appears on the will. For this reason, witnesses should be familiar enough with the testator to confirm his identity. The second reason for the witness requirement is to confirm that the testator was mentally competent -- that he was aware of the will's nature and contents at the time he signed it. A witness must be at least 18 years old and mentally competent. To avoid potential conflicts of interest, most states disqualify witnesses who are named as heirs in the will. Some states, such as Illinois, disqualify the executor of the testator's estate. If a lawyer drafted the will, he may not serve as a witness. At the time of publication, all states require two witnesses to the signing of a will except for Vermont, which requires three. The probate law of most states requires witnesses to sign the will. In many states, however, a will is still valid even if witnesses don't sign it, as long as they take the witness stand during probate proceedings to confirm that they witnessed the signing of the will. Many states require witnesses to sign the will in the presence of both the testator and each other. A self-proving affidavit is a statement by a witness that he witnessed the signing of the will and that the testator was mentally competent when he signed it. The witness must sign a self-proving affidavit in the presence of a notary public after presenting acceptable identification. The notary must then sign the affidavit and affix his seal to it. Knowingly making a false statement in an affidavit is punishable as perjury, a criminal offense, unless the false statement is of negligible importance. Although no state requires the preparation of a self-proving affidavit, using one can persuade a probate court not to require the witness to take the stand at a probate hearing. It can also help resolve doubts about the validity of the will, especially if the witness did not sign the will.